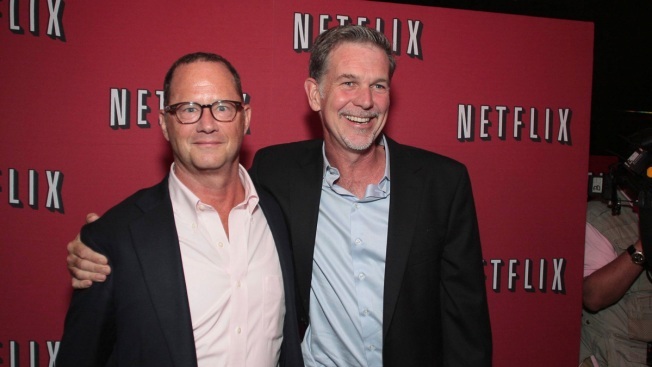 In this Aug. 29, 2012, file photo, Jonathan Friedland (left), and Reed Hastings (right) pose for a photo during the celebration of the first anniversary of Netflix in the city of Puebla, Mexico. Netflix CEO Reed Hastings says he fired the company's top spokesman over use of the N-word. The spokesman, Jonathan Friedland, confirmed in tweets that he was leaving the company, saying he was insensitive in speaking with his team about words that offend in comedy. In a memo to employees, published by Variety and The Hollywood Reporter and confirmed by Netflix, Hastings says Friedland used the word twice — first in a meeting of public relations staff several months ago about sensitive words. Hastings wrote that several people told Friedland how inappropriate and hurtful his use of the word was. Hastings says Friedland, who is white, later repeated the word with human resources staff trying to address the original incident. Hastings wrote the second incident "confirmed a deep lack of understanding."